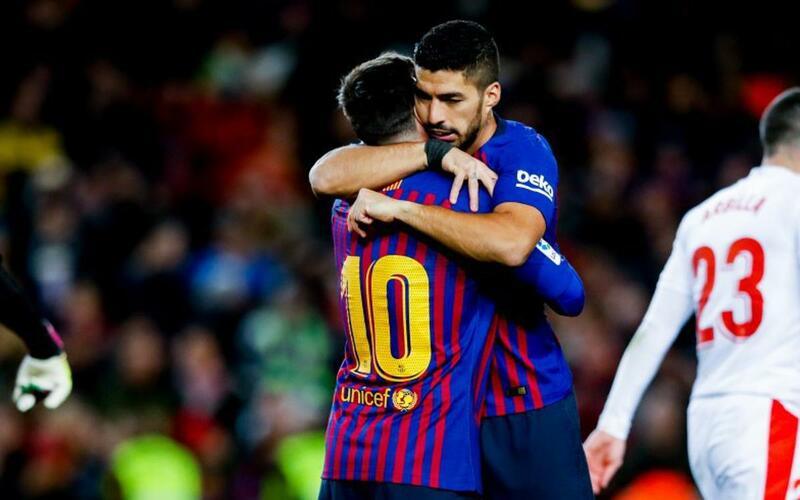 BARCELONA — Luis Suárez scored twice and Lionel Messi added another in between as FC Barcelona cruised to a 3-0 victory over Eibar in La Liga on Sunday night at Camp Nou. Messi’s goal was the 400th of his career in the Spanish top flight, further extending his long-term dominance in a league that he once again leads in scoring on the season. Suárez, who is second in La Liga behind Messi, now trails his teammate by three. Goalkeeper Marc-André ter Stegen, aided by steady defending all night long, turned in his fifth clean sheet in Barça’s last six games. CHECK OUT THE BEST PHOTOS FROM THE MATCH! The win is Barça’s ninth in nine tries against Eibar since the Basque side reached the First Division for the first time ever in 2014. In those nine games, Barça have outscored the Basques 31-4. On Sunday night, Suárez opened the scoring in the 19th minute when he started and finished a precision give-and-go with Philippe Coutinho. The goal was Suárez’s 13th of season in La Liga, and more firmly established him as the team’s — and the league’s — number two scoring threat, behind Messi. Messi, meanwhile, who had been biding his time in the first half, finally found a golden opportunity in the second, and just eight minutes after halftime, in the 53rd, he tucked a low shot just inside the far post to double the blaugrana lead. Suárez then put Barça up 3-0 in the 59th with his second goal of the game. The two superstars went into the game with Messi at 16 league goals and Suárez at 12. By the final whistle, Messi still led, but his lead over his teammate had diminished, to 17-14 on the season. Messi’s goal marked a new milestone for the Argentinian — it was his 400th career goal in La Liga, further cementing his status as the greatest player of all time. Messi’s new tally put him 89 goals ahead of the former Real Madrid player Cristiano Ronaldo’s 311 (#2 all-time) and, the third-ranked Telmo Zarra, who played for Athletic Club Bilbao in the 1940s and 1950s and was the previous record-holder with 243 goals until he was surpassed by Messi is 2014. Suárez’s two goals leave him one shy of a milestone of his own. His next goal will put him into the top five on Barça’s all-time goal scoring list. As a team, Barça have now found the net in 34 consecutive league matches, their best run since a 64-game scoring streak ended in October 2013. Messi now has 13 goals against Eibar in eight appearances, more than any other player. Suárez, for his part, has now scored eight goals against the Basque outfit, including at least one in each of his last six games. Barça’s next game comes on Thursday night, back here at Camp Nou, when they host Levante in the second leg of the Copa del Rey last 16. Barça fell 2-1 at Levante last Thursday night, and will have to turn things around this time to go through to the quarterfinals. Kickoff on Thursday is at 9.30pm CET.